We feel that the window at basement level on the front elevation should retain the three over three glazing arrangement, in order to maintain the consistency of the frontages along the street. No objection. We note that there are no drawings of the proposed new double glazed windows, and these should be provided. No objection. We would note that the drawings of the proposed casement windows have no measurements: the proportions of the glazing bars should match those of the original windows. Given the scale of our concern about this application, we are submitting a separate report from our normal monthly meeting minutes. The addition of new documents to the Planning Portal since 2009 has made the application unwieldy and opaque and this does not aid the consultation process. The covering letter detailing the proposed quite major changes to use and architecture is totally inadequate; there should be a new Design and Access or Planning statement. No Structural Report has been made available despite the proposed scale of excavation and underpinning. This is the last major site in De Beauvoir to be redeveloped. Such is its desirability that it is the subject of constant enquiries from prospective developers, and we are disappointed that the quality of design is not better. NB The 1913 Boris Limited building and the 1887 Mission Hall next door have been locally listed since 2015: no mention of this is made in any of the recent documents. We feel that this should have raised the bar regarding the quality of design of the new buildings proposed to complete the courtyard complex at the rear, where an opportunity is being missed to reflect the site’s Edwardian industrial character in a modern form. The result is piecemeal development with no coherent design style accreted over a number of years, where a fresh view is needed now that the residential/commercial mix has been changed. When an application for this site went to appeal in 2007 and was refused, the main issue stated in the Summary of Decision was “The effect of the proposal on the character and appearance of the area having regard to its location within the De Beauvoir Conservation Area and adjacent to listed and locally listed buildings”. The principle remains: the poorly designed large, flat expanse of the north elevation of the proposed commercial building facing De Beauvoir Square is of particular concern. This will both form the view from a row of listed buildings, and (again, as the Inspector pointed out) will be visible between the houses on the Square. 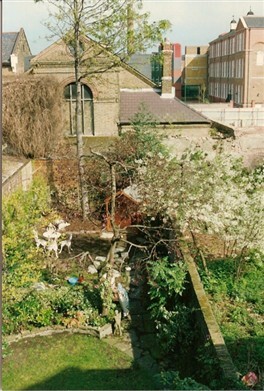 These views between pairs and short terraces of houses are noted as a particular feature of De Beauvoir in the 2008 Conservation Area Appraisal (p.53). Granted, the current industrial building is not beautiful, but this is no reason to approve something unattractive, and bulkier, in its place. The relatively recent Court of Appeal decision in the case of Barnwell vs East Northamptonshire DC 2014(2) made it clear that in enacting section 66(1) of the Planning (Listed Buildings and Conservation Areas) Act 1990 (1), Parliament’s intention was that ‘decision makers should give “considerable importance and weight” to the desirability of preserving the setting of listed buildings’ when carrying out the balancing exercise'. The effect on the surrounding properties of digging a basement over an even more substantial part of the site is not addressed. Demolition of buildings around the Edith Cavell School on Enfield/Hertford Rds some years back shook houses a considerable distance away in De Beauvoir Square and the subsequent crushing of material on site caused widespread vibration problems. The structural integrity of both the Mission Hall and the Boris building are of great concern and we need to be reassured that the proposed underpinning of the Mission Hall with a new floor construction and the replacement of the western façade of the Boris building will not damage both buildings irreparably. This was despite the fact that the new development on the north side was to have been a full 2m taller, and bulkier, and the highest point further north. This was a major omission, and as the tallest point of the roofline of the new proposed northern commercial block has now been moved closer to the Listed Buildings on De Beauvoir Square, it is therefore even more important to require that a new Daylight and Sunlight Report be commissioned. ‘If a living room of an existing dwelling has a main window facing within 90o of due south, and any part of a new development subtends an angle of more than 25o to the horizontal measured from the centre of the window in a vertical section perpendicular to the window, then the sunlighting of the existing dwelling may be adversely effected. NB The angle between the development and the windows of De Beauvoir Square is no longer shown on the new plans, making this impossible to assess. There were no daylight distribution results for the De Beauvoir Square houses. There were no Annual Probable Sunlight Hours results, ditto. No argument is given as to why it is necessary to rebuild the brick walls separating the site from 25-28 De Beauvoir Square to a much lower height of 2.1 metres. The De Beauvoir Square houses are statutorily listed, and as the garden wall forms part of the curtilage of these properties it is included in the listing. The original walls between the gardens of 72-80 Mortimer Road and the site should be retained and the new wall in matching London stock bricks built behind them. In cases where the garden wall forms part of buildings that are to be demolished a replacement wall, also in matching London stock bricks, should be built to a height to preserve the privacy and security that is currently enjoyed by these properties. Retention of the BORIS LIMITED sign is not now mentioned, and the application should have made clear that it will be retained as previously stipulated. We trust that the Conditions agreed in 2010 will be carried forward. We note the recommendation that some glazing should be obscured in perpetuity, and ask why it is necessary to block up the handsome existing rear windows of the Mission Hall rather than use obscured glazing. We are concerned that the applicant should carry out all work according to National Standards, particularly the safe removal of the asbestos roofs, and the chimneys beside the Mission Hall, and urge that the applicant should be required to employ a member of the Considerate Constructors Scheme for any works. We would note that Community engagement by the applicant has throughout the long history of this site been completely missing, including at this stage. We feel that, with a development of this size, and relative importance in the Conservation Area, it is unacceptable that an application be registered by the Planning Department without evidence that this has been carried out, in a full, frank and courteous manner. In cases like this one where there has been substantial delay we will check to see if there have been any material changes since the Committee originally agreed the scheme that have any significant bearing on the decision to grant permission, or on the contents of the S106, or on the conditions, etc. An application that is a set of regurgitated documents with little investment in consistency and detail does not bode well for the implementation of the project. It should be resubmitted as a new application after revision, and commissioning of appropriate documents. This is the last very large development site in the De Beauvoir Conservation Area, and it should be seen as an opportunity to require design of the highest quality. Given these changes and the scale of the development, this application once improved should not be approved by delegated powers, but should go to the Planning Sub-Committee. We strongly object to this application. This is a prominent site on the Kingsland Road opposite a Grade II listed Victorian crescent and a well-designed, high quality, building is required. We appreciate that Hackney is under great pressure to house a large number of homeless people but focussing solely on providing the maximum number of rooms on one site is not the answer to the problem. It is arguable whether the site might be better used for permanent accommodation. The Planning Statement refers to the problems that are inherent in the neighbouring Metropolitan Hospital and St Peter’s Way annexe as a result of their design and expects that the new hostel will help to ameliorate the situation. We are very concerned that this won’t be the case. Will one laundry room, 40m2 in size, be enough for the occupants of 292 rooms plus those in the neighbouring hostels? We doubt very much that the two internal meeting rooms and smaller ancillary spaces will provide adequate communal space for that number of residents; especially if it is proposed that they could be used for indoor sports such as table tennis, yoga and fitness classes. Each floor has been designed to accommodate the maximum number of rooms. Pram stores and studies have therefore been shoehorned into the remaining spaces, seemingly without thought as to whether they are of adequate size. Adults will need space to access computers and wifi as well as children doing homework, and not just for recreation, but for job hunting and for work. In school holidays there would be particular pressure on these very small spaces, which could lead to friction. The external space and play area at basement level will be overshadowed by the surrounding buildings and will not provide the amenity that is greatly needed. Even the Daylight, Sunlight and Overshadowing report concludes that this area has relatively poor solar access. It is deceptive to state that this space is a supplementary amenity area to the private balconies and terraces. These are not communal areas where residents can socialise. The fact that residents will not be allowed to invite anyone into their room(s) to socialise creates an even greater need for high quality and ample socialising space, if residents are not to feel confined in their small living spaces. It is just not acceptable that those living next door in the Metropolitan Hospital are asked to tolerate lower levels of daylight and sunlight than would be required elsewhere because they are in temporary accommodation. The word temporary is a misnomer as sadly some of the residents will be there for considerably longer than a few weeks or months. There is a concern that the terraces at basement level on the Kingsland Road façade, and perhaps to a lesser extent those on the Enfield Road façade, will become repositories for rubbish. We question whether a single security guard will be sufficient for a building this size. If they need to investigate a problem out of hours, when the hostel management team are not on site, the entrance desk will be unmanned. The Planning Statement and the Management Plan suggest that the likelihood of antisocial behaviour is minimal because of the precarious status of the residents. However we understand that residents in the surrounding streets have already suffered from antisocial behaviour by residents of the current hostel in recent years. Meanwhile those living in the existing hostels have highlighted a number of serious issues many of which are the result of poor management. We appreciate that these are not planning matters but often they may be mitigated by good design. If approved this hostel will be one of the largest in London and, although that will go some way toward alleviating Hackney’s acute need for temporary accommodation, the long term effects on the residents may be harder to deal with. We feel that the concentration of such a large number of people in inadequate quarters is inhumane. A report by Healthwatch Hackney and City and Hackney Mind notes the concerns of families that cramped temporary housing was damaging their children’s mental health. The stress must be taking its toll on adults too and there will be many very vulnerable people with totally different issues and needs living very closely together. The hostel will be home to large numbers of people and unless the building is well constructed with high quality materials, both externally and internally, it will look very shabby in a short space of time. It is on a prominent site in the Kingsland Conservation Area and just beyond the eastern edge of the De Beauvoir Conservation Area. The Metropolitan Hospital is a Locally Listed Building. This setting alone would demand a well-designed building but we should also take the opportunity to provide the very best new start for the residents. Just because you have had the misfortune to be made homeless should not mean that you have to suffer second rate living accommodation, be it for a few weeks or for many months. We have no objection. We are pleased to see that the applicant has retained a specialist builder to produce a method statement. We would ask the Listed Buildings Officer to ensure that the company which actually carries out the work is equally competent.